Anchorage-based goalie Drew O’Connell, a former Tiger, picked up a win against his hometown ECHL Aces when the Ontario Reign needed an emergency fill-in netminder. He stopped a penalty shot in a 3-1 win. That so impressed the Reign, who took O’Connell on the plane back for a home game against Las Vegas (19 saves including one penalty shot) and a 4-1 victory. The wins were first reported by the Anchorage Daily News who first reported on their hometown goalie and noted he had filled in as a backup for the Aces a few times last season. As of Wednesday night, O’Connell’s pro stats are 2-0-0, 1.00 goals-against average, .944 save percentage and 44 saves, including two penalty shots, in 65 minutes (5:00 scoreless relief on Jan. 11). Here is a good game story featuring O’Connell’s exploits against the Aces and how former Air Force player Jacques Lamoureux passed on word through his brother (and North Dakota alumnus) Mario about O’Connell being available. That is reason No. 2,349 why I love college hockey. CC will play North Dakota four times next season according to a tentative schedule compiled by the Grand Forks Herald. The dates are UND at CC Nov. 30 and Dec. 1 and the Tigers in Grand Forks Jan. 11-12. J.T. Brown joined the growing list of WCHA early departures. Joey Crabb is an unrestricted free agent this summer. It remains to be seen what the Leafs’ offseason plans may be after another disappointing season. Chad Rau was sent down to AHL Houston to free up a roster spot for rookie Jason Zucker. The Wild need to give the DU junior some ice time to determine his role. UConn is looking to become the 12th member of Hockey East. It is now a week until the Frozen Four begins. Here’s some game notes from Minnesota. The Grand Forks Herald does a good job breaking down the playoff scenarios in the WCHA. Concussions have taken a toll on Wisconsin this season which plays Minnesota this weekend. The MSU Mankato Mavericks have rounded the corner after a spate of injuries, something their opponent this weekend, North Dakota, would love to able to say. The Mav freshmen are leading the team. The four Alaska Anchorage seniors have two final home games this weekend, when the Seawolves host Bemidji State. Both teams are headed on the road for next week’s WCHA playoffs. No 2 Minnesota Duluth heads to St. Cloud State. The Bulldogs have a chance at winning the regular season title while SCSU could garner home playoff ice if the stars align right. UMD has a good defensive line coach Scott Sandelin relies on. Colorado College’s seniors know and accept that how they perform over the next couple weeks will determine how they are remembered. A win Friday night would clinch home playoff ice. Ticket sales would start immediately after the game against visiting Michigan Tech. The Denver Athletics Twitter account announced that freshman goaltender Jussi Olkinuora will start in goal tonight for the Pioneers against the University of Nebraska-Omaha. Here’s NHL.com’s take on the series. Apparently not all of DU’s equipment (13 of 22 player bags) did not make the initial trip to Omaha. Former Tiger goalie Drew O’Connell was re-signed by the ECHL’s Alaska Aces, which found themselves couple netminders short due to AHL promotions. Aaron Slattengren is trying to lead the Colorado Eagles to the playoffs in their first season in the ECHL. Mark Stuart picked up two assists for Winnipeg against Florida. Michigan Tech's Jordan Baker recorded a goal and an assist to spark the visiting Huskies to a four-goal third period in a 4-4 tie at No. 1 Minnesota Duluth. Here’s an update on the progress NCHC commissioner Jim Scherr has made in the first three weeks of his tenure. He’s really hit the ground running. 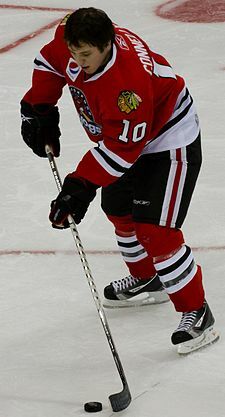 CC’s Chad Rau was one of four former Tigers playing in an NHL last Saturday. Here’s a feature on him, Nate Prosser and a list of how former CC players are doing in the AHL and NHL. Air Force standout Jacques Lamoureux is the 13th former Falcon to play part-time pro hockey. He’s teammates with former Tigers Drew O’Connell and Brian Swanson for the ECHL’s Alaska Aces. Brian Connelly was traded to Calgary on Friday. Hopefully he’ll get a better shot at making his NHL debut with the Flames organization. DULUTH — It took 10 shots and a 10-minute span for the University of Minnesota Duluth to build what appeared to be a comfortable 4-0 first-period lead Friday in its Western Collegiate Hockey Association series opener with Michigan Tech University. Maybe a bit too comfortable of lead. After freshman left winger Caleb Herbert potted his second goal of the night to put UMD up by four with 4:47 to go before the first intermission, the top-ranked Bulldogs (17-4-4 overall and 11-3-3 WCHA) looked like they were well on their way to a ninth straight home win and an eighth consecutive victory over their long-time rivals. But that’s when the UMD scoring burst stopped and the Michigan Tech rally began. The Huskies (11-12-2 ; 8-7-2) struck for four unanswered goals, including three in the third period – a period UMD has more or less owned this season – to gain a 4-4 overtime tie with the defending NCAA champions before a near-capacity crowd of 6,670 at AMSOIL Arena. Herbert’s two scores and goals by senior right winger David Grun (just under six minutes after the opening faceoff) and defenseman Brady Lamb (at 10:58 of the first) came on the first 10 shots the Bulldogs put on Michigan Tech goaltender Josh Robinson. He stopped the last 27 shots he faced to finish with 33 saves while helping hold the Bulldogs scoreless on all four of their power play chances. 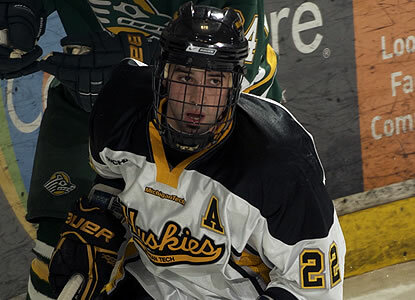 He and the Huskies also did something no team has been able to do in 23 games – keep two-time All-American center and the nation’s number one point getter Jack Connolly off the scoresheet. ANCHORAGE — Playing their first home game in almost two months, the Alaska Anchorage Seawolves could not overcome an early deficit as they fell 4-2 to the 15th-ranked Denver Pioneers in a Western Collegiate Hockey Association game at Sullivan Arena. The Seawolves (6-15-2, 3-15-1 WCHA) got goals from first- and second-line centers Matt Bailey and Eric Scheid, while winger Daniel Naslund tied for the team lead with his seventh assist of the season. The Pioneers (14-8-3, 9-5-3) received goals from four different players as they improved their season-best winning streak to four games. DU struck first when freshman winger Ty Loney scored even-strength at 8:13 of the first period. Sophomore center Nick Shore gave the visitors a 2-0 advantage at the 16:16 mark, slamming home a power-play tally. Bailey quickly cut the deficit in half, however, as the sophomore from Winnipeg scored his fourth goal of the season just 96 seconds later, corralling a centering pass from Naslund and beating DU goalie Adam Murray (30 saves). Pioneers leading scorer Drew Shore would pick up his 16th goal only 89 seconds into the second period for the eventual game-winner and to extend the visitors’ lead to 3-1, and the junior added his 37th point on linemate Luke Salazar’s goal with seven minutes left in the second. The Seawolves outshot the Pioneers 32-26 overall, including 10-6 in the third period, breaking through for the game’s finally score on Scheid’s goal with 3:47 on the clock on a goal by Scheid. MINNEAPOLIS, Minn. – For the first time since Dec. 30, the third-ranked Minnesota men’s hockey team won on a Friday night, topping in-state rival St. Cloud State 2-1 in the first game of a home-and-home series at Mariucci Arena. The Gophers received goals from senior Jake Hansen and sophomore Nick Bjugstad and held the Huskies to a season-low 13 shots on goal on the night, proving that the Gophers’ defense is as tough as CC coach Scott Owens said it was last weekend. It was the third 2-1 game in a row for the Gophers. GRAND FORKS, N.D. — Freshman Stephane Pattyn picked a fine time to score the first goal of his college career at the University of North Dakota. His tally with just under two minutes left in the third period not only proved to be the game-winner in an important WCHA contest with Wisconsin, but it also came on his 21st birthday. UND’s 5-3 victory before 11,769 fans at Ralph Engelstad Arena improved the team to 14-10-2 overall and 10-9-0 in league play. The Badgers fell to 12-11-2 overall and 7-10-2 in the WCHA, four points behind UND in the battle for home ice during the playoffs. Sophomore defenseman Dillon Simpson, who notched his first goal since last February, also felt a sense of relief. UND coach Dave Hakstol noted the importance of the team getting scoring contributions across the lineup. BEMIDJI — On a night when Bemidji State was out shot 40-26, senior goaltender Dan Bakala stood tall turning aside 39 Mankato shots to open the Western Collegiate Hockey Association series with a 2-1 victory Friday at Sanford Center. Tied 1-1 midway through the third period, Jordan George potted his team-leading 13th goal of the season to provide BSU with the offense it needed to break the stalemate, gain two points in the league standings and improve to 12-11-2 overall and 6-9-2 in WCHA play. Minnesota State took the first lead of the game at 8:58 of the opening period when Max Gaede buried his own rebound. Bemidji State clawed its way back into the game before a back-and-fourth second period came to an end. 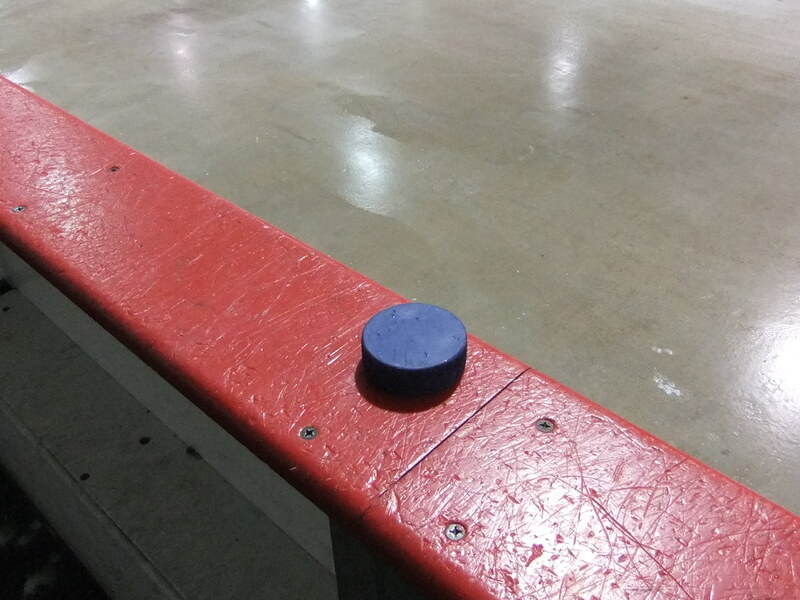 With 4:40 to play in the period, Jake Areshenko found Danny Mattson at center ice with an outlet pass. Mattson skated into the zone and capped the play a wrist shot placed just over the glove hand of the MSU goaltender Phil Cook from the right face off circle. The goal was the second of the season for Mattson and stretched his current scoring streak to a career-best five games. No. 10/12 Colorado College and Nebraska Omaha were idle. Former Tiger Brian Connelly, pictured at right, was named as an AHL All-Star defenseman for the second year in a row. Drew O’Connell is seeing his role with the ECHL’s Alaska Aces grow from emergency backup to No. 2 on the current road trip. It doesn’t hurt that the boss of his “day job” is former CC defenseman Brian Bethard, who gave him the chance to leave on a 20-day road trip. O’Connell’s teammates include former Tiger Brian Swanson, healed from an upper-body injury, and former Air Force standout and Hobey Top 10 finalist Jacques Lamoureux. Minnesota Duluth’s Jack Connolly has a shot at the 200-point career milestone. Minnesota is No.3 in both polls but a bubble NCAA team according to USCHO Pairwise rankings. CC, rated No. 16, would fall one spot short with the Atlantic Hockey Association playoff champion taking the 16th and final spot. There’s a lot of games still to be played though. Nebraska Omaha picked up a recruit from Duluth East. Merrimack, ranked 8th in the latest Pairwise, lost a key senior to season-ending ankle surgery early Saturday night. A longtime Quinnipiac coach passed away. 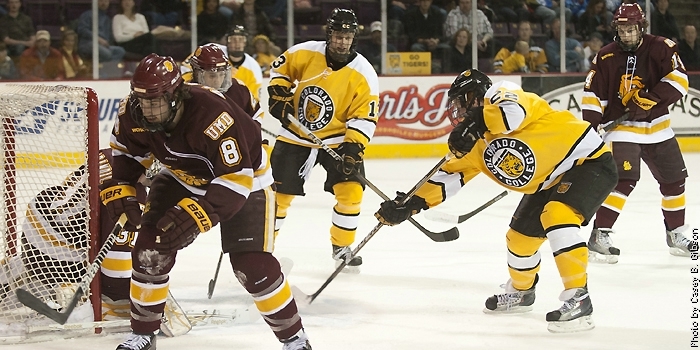 Games for Friday, January 27: Michigan Tech at Minnesota Duluth (WCHA), 7:07 pm CT; St. Cloud State at Minnesota (WCHA), 7:07 pm CT; Minnesota State at Bemidji State (WCHA), 7:37 pm CT; Wisconsin at North Dakota (WCHA), 7:37 pm CT; Denver at Alaska Anchorage (WCHA), 7:07 pm AT. Games for Saturday, January 28: Minnesota at St. Cloud State (WCHA), 7:07 pm CT; Minnesota State at Bemidji State (WCHA), 7:07 pm CT; Michigan Tech at Minnesota Duluth (WCHA), 7:07 pm CT; Wisconsin at North Dakota (WCHA), 7:07 pm CT; Denver at Alaska Anchorage (WCHA), 7:07 pm AT.